Accessories can make or break an outfit, and no one knows this better than the queens of street style. 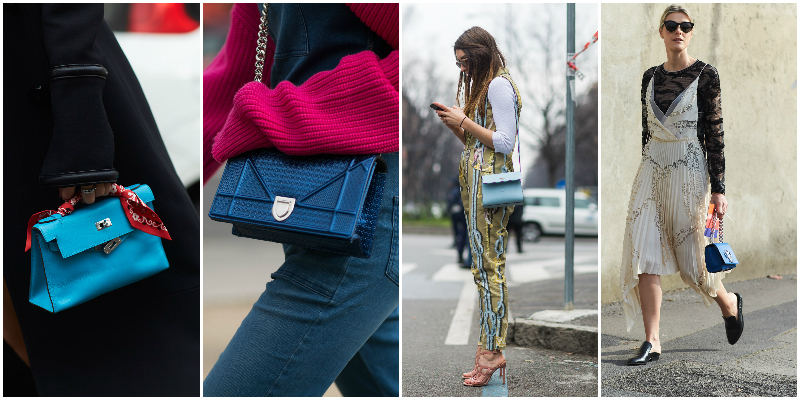 So follow their lead and invest in these ten stylish autumn and winter accessories spotted on the streets. This season’s accessories either fit into the “classic and cool” category or the “kooky and fun” group. If classic and cool is your style, invest in simple and chic berets, black silk scarves, little blue bags and vintage, round sunglasses. If you lean toward the kooky and fun look, get inspired by 80s aviators, see-through heels, pop art designs, floral embellishments, furry monsters and wild pops of orange. Patent booties with see-through heels took out the crown for chicest footwear this fashion month. Sleek, futuristic and oh-so-cool, this trend is definitely one to get behind. The street style set rocked these boots in neutral shades of black, beige and grey with a little colour injected into the perspex heel. Perfect to wear dressed up with a skirt or dressed down with a pair of jeans, these stylish heels are your new wardrobe essential. Add a French touch to your outfits this autumn with the addition of a beret. Chic and cute, berets are the perfect way to polish off a sophisticated, winter look. Learn from street style’s best and choose a basic beret in a block colour that complements or blends with your outfit. Pick one made from felted wool to also keep you warm as the cold weather rolls around. You can even add gloves to give your look some old-world charm. Whether you prefer a choker, bandana or scarf, the neck is a main focal point of sartorial style this season. For those who do favour a scarf, opt for a black, silk or satin version. Stylishly chic and easy to pair with any outfit, the black, silky scarf is the perfect low-maintenance accessory of the season. Simply tie it high around your neck and allow it to finish off your outfit and elevate your style cred. Graphic applique and embellishments have been some of the largest fashion trends in recent months. Their 3D nature combined with their eye-catching detail makes this trend an intriguing addition to any outfit. Try the floral bag embellishment trend this season. Seen on the street style set of Europe, this trend is chic and a touch kooky. Wear it and allow it to be the standout feature of your outfit. Fur pom poms have been a continuing trend for some months now. And as usual, the queens of street style have found a way to keep the trend fresh and relevant while staying one step ahead of the rest of us. The update for this accessories trend is “furry monsters”; fur pom poms and bag details which are little characters. Think pom poms with eyes and faces and some even with bodies! These little creatures are a fun and creative way to turn even the simplest bag into something completely trend-worthy. Round, thin, metal frame sunglasses brought a touch of the 70s hippie culture into 2016 this season. Paired with modern chic outfits, this vintage throwback was updated to appear more sleek rock than bohemian. The classic style was spotted on fashion “It” girls from Milan to Paris. The simple outfit addition proving that every detail counts when putting together the perfect look. Pick a pair up for yourself and wear it with loose, carefree hair. If the 70s aren’t for you, take a trip back to the 80s this season with your eyewear. Almost comically large, 80s style aviators were spotted on the European streets this fashion month. Oversized, flat on top and round on the bottom, this style of glasses covered many faces of street style stars. Unmissable was Anna Dello Russo’s take on the trend which resembled ski goggles more than regular sunglasses. Have fun with this trend and pair it with minimal makeup and modern styling. Aren’t you sick of wearing that same old black bag? So are the street style stars. Instead of black, the basic bag of this season was in blue. Still subtle and easy to match, blue bags in a variety of hues made the perfect outfit companions for this year’s Autumn/Winter shows. The new colour of the season was, of course, featured on one of the most popular styles of the season; the mini bag. Pick one up for yourself as your new go-to bag for daywear. 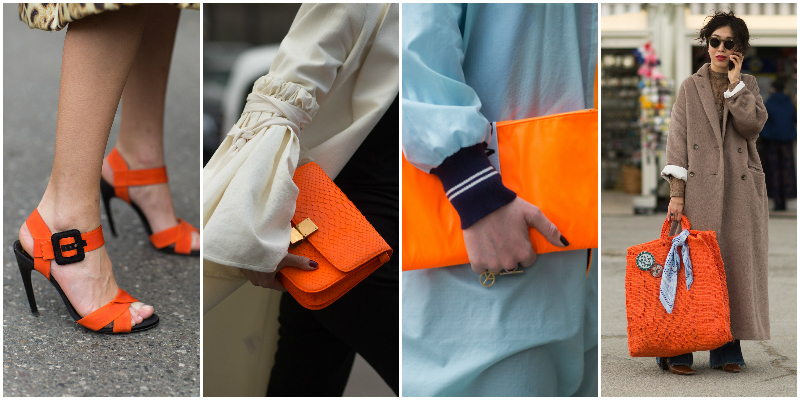 Bright orange was the standout colour for street style accessories this fashion month. Bold, eye-catching and fierce, these pops of orange were unmissable in the best of ways. Spotted on accessories ranging from stilettos and clutches to large tote bags, this colour was a favourite amongst the street style stars. Our favourite looks perfectly played off the fierceness of the orange with the softness of a baby blue. Pop art inspired accessories made a fun appearance on the streets outside the Autumn/Winter 2016 fashion shows. Spotted on bags and shoes, this trend brought many outfits to life through its use of bold colours and quirky pictures. Whether it was the robot-esque, Karl Lagerfeld caricatures on bags or a simple pair of closed eyes on heels, pop art invaded all the coolest accessories. This stand-out trend is sure to add a talking point to any outfit.